There I was at a comedy night out. Dressed in clothes two sizes too tight. Laughing until my belly wobbled. Until I saw the dinner menu. I can only describe it as posh Weatherspoons meets Dallas Chicken and Chips. And nestling among the towers of battered chicken and deep fried tex mex, was a Chicken Tikka Masala. Complete with pilau rice and naan bread. Resplendent in its position as top choice for mopping up the alcohol running riot through 100 hysterical humans. As you all know, Chicken Tikka Masala has no place my kitchen – self-respecting Indian and weight watcher as I am. 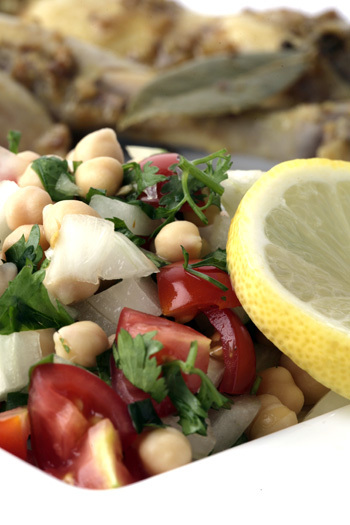 Give me a jeera chicken served with some lemony channa (chickpea) salad, any day. This is what I cooked when my little sis came over from uni mid-week to collect a visa for her next exotic break. I marinated the chicken in two seconds flat before I left for work in the morning and while it cooked in the evening, I made the channa salad. My sister licked her plate clean, which doesn’t say much as she’s a hungry student. My husband loved it too. That really counts for something. In a large mixing bowl, mix together the rinsed and drained chickpeas with all the other ingredients. Add salt to taste and enjoy at room temperature. Hi Mallika, it looks lovely. Will half a lemon register on 400 gm of chickpea? Thanks ladies! Sra – a 400gm tin of chick peas actually gives you only 250gm, after rinsing and draining. So half a lemon is more than enough. i love that the summer recipes are coming out!! ps: do you know a supermarket to buy frpozen fenugreek cubes? 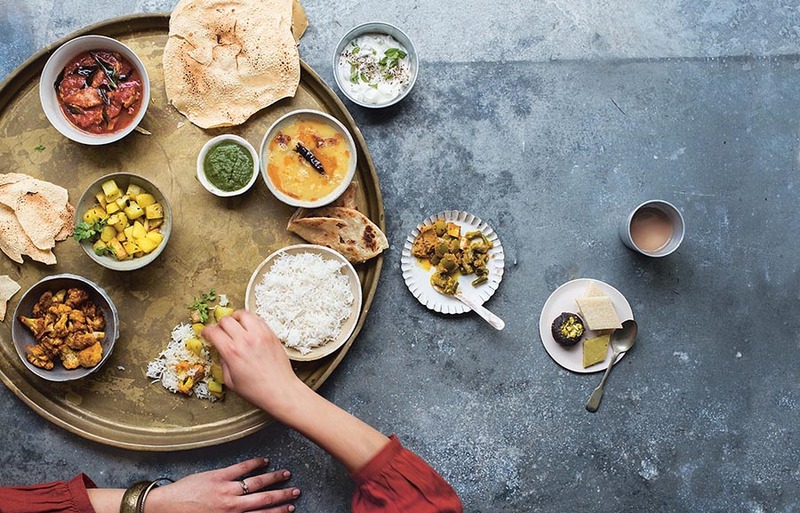 and where dyou recommend buying indian spices – drummond street? because i only have halal shops around where i live (i think) and we’ve all gone collectively mad trying to uncover what ajwain is in english!! Hey Mangs – Drummond Street is where I shop and it’s the nearest place to you too. Go to Ravi, the Indian spice shop there. I’ve been shopping there for the last 15 years!! Ajwain is carom seeds, but Ravi’s will know what it is. Also, they will have frozen methi. Tesco sells it, but maybe not where you re. If Ravi doesn’t have it, just buy the fresh stuff and stick it in the freezer. Same deal! More summer recipes on their way… you must let me know how it goes! Thats a very fresh looking salad. Sis ki shoot e geche ? Hi Mallika, sorry I haven’t been visiting much! Heh heh, my sis would lick her plate clean, too, not because she’s a starving student, but she doesn’t know how to cook! 🙂 Aaah, simple is always best, your salad looks like a crowd pleaser! That looks absolutely delicious mallika!! I am off to tescos today, hope i find those frozen fenugk cubes as we have a huge collection on asian stuff here in ipswich! whats wrong with chicken tikka masala? My favorite salad! Sooooo yum and good for you. I usually add a little mint and splash of olive oil (I know you don’t cook with it in indian cooking but it works well as a salad dressing) to cut through the acid of the lemon. Thanks for sharing I LOVE your site. My brother proposed I would personally maybe this way web-site. He or she appeared to be entirely perfect. This post essentially produced my personal day. You actually can not visualize exactly how a good deal time I’d used just for this information! Many thanks!